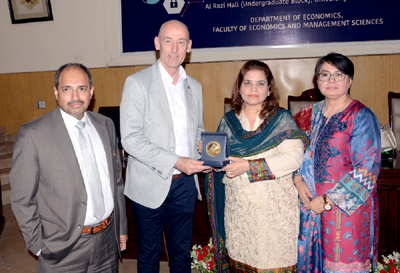 LAHORE: (Wednesday, October 17, 2018): The Department of Economics, in collaboration with the Punjab University Directorate of External Linkages, organized a lecture on Knowledge Economy, delivered by Professor David Rooney, Professor of Management and Organization Studies at the Macquarie University, Sydney, Australia. Dean Faculty of Economics and Management Sciences Professor Dr. Nasira Jabeen, External Linkages Director Prof. Dr. Kanwal Amin, Departmet Department of Economics Chairman Prof. Dr. Mumtaz Anwar, faculty members and students from various PU departments and University of Lahore, Minhaj University and members of civil society attended the lecture. Prof. Dr. Mumtaz Anwar welcomed the guest to University of the Punjab. In his keynote address, Prof. Rooney distinguished knowledge from wisdom, and drew upon his research to establish the social and structural differences between developed economies and less developed economies. He emphasized on the differences in social organization, whereby the developed economies – mostly in the north western part of the world – have a more individualistic social structure, while the less developed societies – mostly in the global south – boast a more collective social fabric. He said that this difference in social structure has profound impact on knowledge sharing, in turn affecting possible modes of development and economic growth. He said that entrepreneurship and innovation were affected most significantly and the knowledge sharing structure has deep implications on the future avenues of growth. The discussion was followed by an interactive question answer session, where the audience and Professor Rooney shared ideas, opinions, and elaborated on various ramifications of the ideas presented in the lecture. 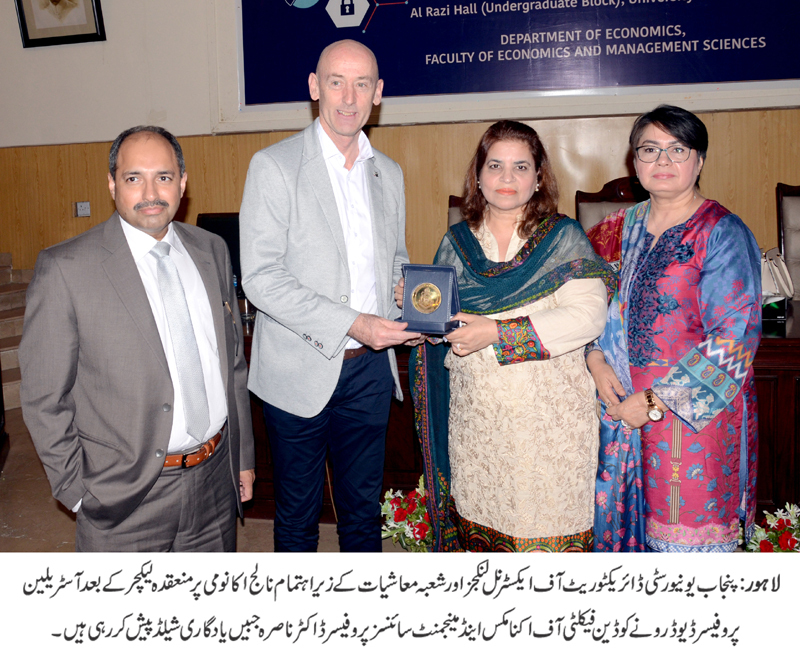 Prof. Dr. Kanwal Amin and Prof. Dr. Nasira Jabeen shared their knowledge with the audience and thanked the distinguished guest for his visit to the university for delivering the lecture. A Punjab University shield was also presented to the distinguished guest as a token of appreciation. Earlier in the day, Prof. Rooney was welcomed at the Department of Economics where the Department Chairman and the faculty welcomed him to the university and discussed with him possible avenues of future collaboration.